| A writer of thrillers, suspense and mystery. On the beach. This, as an archive, will remain as long as WordPress.Com exists. However, there will be no new posts created here after this one. It’s all nice and shiny over there and I’d suggest you bookmark that link, since I haven’t figured out how to auto-tweet new posts (which many of you may believe to be a good thing). Also, it’s more than likely a number of links in the new house will point over this-a-way, and will for some time. It quite possible I”ll never catch them all. So, thanks for being a regular visitor to this old place, and hope to see you over at the new one. If you read “Book ‘Em“, you’ll recognise Rico from the tail end of that book. He had a small part in that story. In this story, he is instrumental in kicking off the events which dictate Detective Dan’s activities..
Rico received a Masters in Chemical Engineering in the midwest. But he had very little interest in working for someone else. Top marks, way above average IQ and a sociopathic personality combined with his inherent laziness and he drifted into a life of crime. He also drifted south. Nebraska was too cold for him, even with is overly-padded hirsute body and he ended up in Florida a bit over five years ago. A quick look at the competition reveal some under-represented niches and he slowly started his climb in the criminal underworld. Opposition was removed in creative ways, rarely with direct involvement from himself. Getting two opponents to fight with each other was a particular favorite, while he sat back and watched the fun. As “Family Matters” opens, Rico is proposing a four-way conglomerate between himself and three other b-list black hats. The reactions to this proposal propels the story forward, giving Rico a much higher profile than he ever imagined or wanted. “Family Matters” is scheduled to be released in November, 2011. 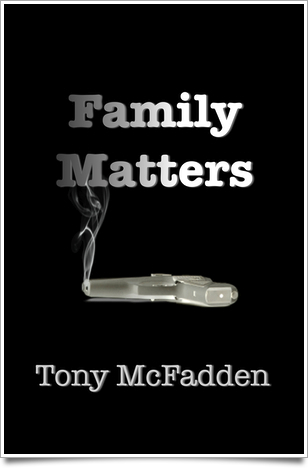 If you’d like me to let you know when ‘Family Matters’ actually hits the (e)shelves, fill the particulars below and I’ll give you a heads up. Vladimir Petrovski comes from Odessa by way of Brighton Beach. In his late teens when his family emigrated from the Soviet Union to New York, he quickly fell into an easy life of crime, starting off with cons and working his way up (or down, depending on your perspective) to more violent and lucrative endeavours. Twenty years ago he left the cold, harsh New York winters for Florida. Through a vicious campaign of “hostile takeovers” he has become the reigning leader in South Florida when it comes to money laundering, prostitution and distributing with very broad channel any illicit drug you may want. At his side, travelling with his family to New York, and with him to Florida, is George Sajok, a knife man so vicious potential victims have been known to commit suicide rather than face him. George is his stick. When there are obstacles in Vlad’s path, George cuts them down to a manageable size. Vlad is part of the gathering at La Loggia hosted by Rico (we’ll get to him next week), and is not at all in favour of Rico’s proposal. What he does after that meeting drives the actions of the police, the FBI and others in his crime fraternity. In one of the hottest Novembers in South Florida history. If you’d like me to let you know when “Family Matters” actually hits the (e)shelves, fill the particulars below and I’ll give you a heads up. There are cousins and nieces and nephews on facebook and that’s the only connection I have with them, what with the 12 timezones ans 12,000 miles or so between us. I have a daughter with a mild learning disability who only shows her real feelings, some days, on facebook, and it’s a good barometer of her internal angst. Trust me, that’s an important thing to track. I’m going to use a different browser for fb (Safari, which isn’t good for much anyway) which should eliminate the ‘we know what you’re visiting’ privacy concern. They still piss me off. Also available at iBookstore, Nook, and other e-tailers. Get a paperback version of G'Day L.A. from Amazon.